If you’re looking to replace your tatty old bash hat with something flashy of the carbon variety then hopefully this handy guide will help make your mind up. 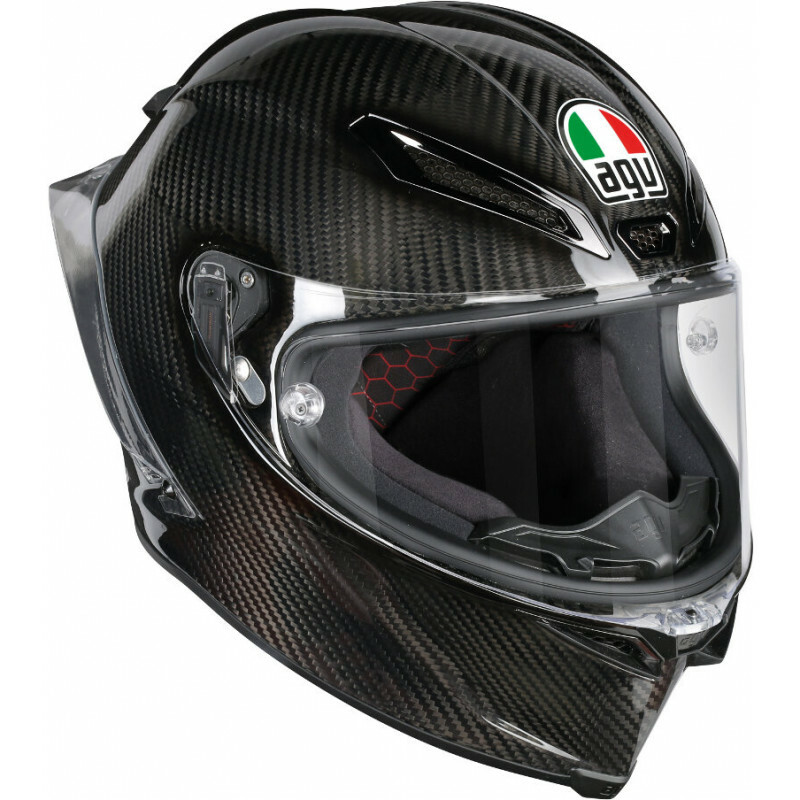 Carbon fibre has been around for over half a century but it’s only within the last couple of years that it’s found its way into motorcycle helmets. Originally developed by the Ministry of Defence, the black stuff was perfect for use in the aeronautical industry where its combination of light weight and strength made it an ideal material for aircraft components, weighing three times less than steel while retaining the same level of stiffness. Carbon fibre eventually appeared in top level motorsport and in particular Formula 1 where light weight and strength are essential for high performance and driver safety. With recent manufacturing processes becoming far more mainstream and the costs of production dropping significantly, carbon fibre is no longer the top secret material exclusive to fighter jets and top F1 teams. It’s now everywhere in the motorcycle industry – we’re all familiar with carbon wheels and now BMW are making entire frames out of carbon for its S1000RR HP4 Race. Whether you’re looking to improve form, function or both then the replacement of standard parts with carbon fibre has become a big business. Even though it’s strong it can also be brittle when exposed to impact. This is why many helmet manufacturers choose to use either a carbon shell or a composite of carbon fibre with other lightweight materials such as Kevlar and fiberglass for a better balance of strength and safety in the event of a crash. The Arai RX-7 RC is at the top of the tree where carbon fibre helmets are concerned, price wise at least. Produced in limited numbers each RC is crafted by an Arai expert who receives up to five years of training on how to create each Arai shell by hand. Each RC will take around 18 man-hours to make and will undergo five separate quality-control inspections throughout the building process. The outer shell consists of eleven layers of premium carbon fibre reinforced with PB-SNC net strands. 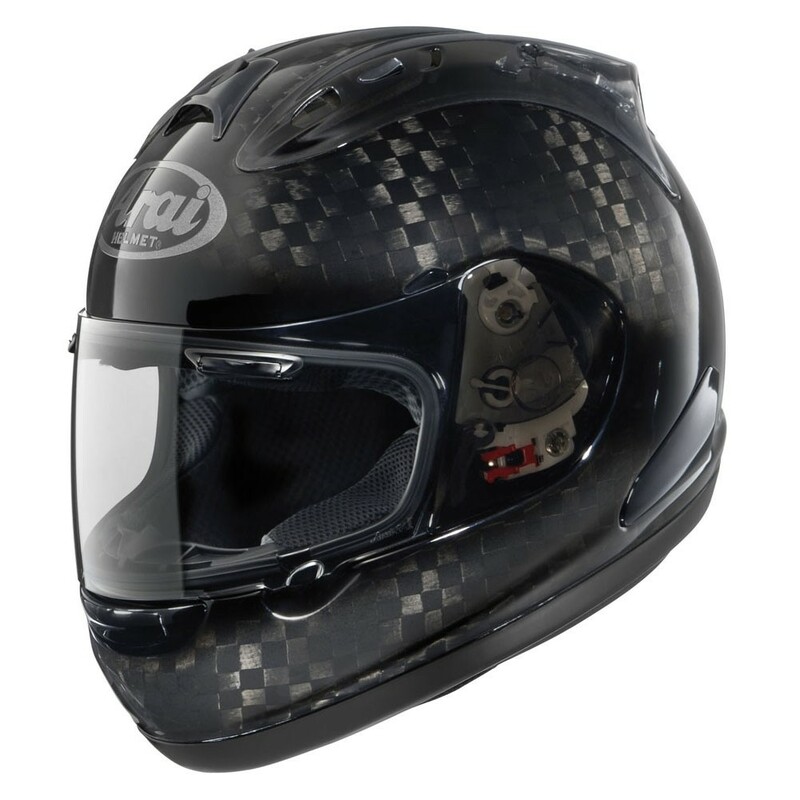 The carbon itself is aircraft quality with Arai’s own resin plus Zylon reinforcement which Arai say is the perfect mixture for the outer shell. The RC is based on the car racing GP-6 equivalent which was developed for use in Formula 1 and comes with a 5-year warranty. At that price though we’re not sure we’d ever bring it out of the display cabinet. AGV have stepped things up a notch with the release of the Pista GP-R. Designed as part of the AGV standards project in conjunction with Valentino Rossi, the Pista GP range has been in development since 2009. Together with his input the first obvious advancement of the Pista GP-R is the extra range of vision given through the visibly larger visor, particularly when the rider is looking up from a tucked position and is also 15 degrees wider compared to the previous GP Tech model. The Integrated Ventilation System provides a 193% improvement of surface area of the air intakes. Surprisingly though, the Pista is the heaviest of the bunch at a rather hefty 1510g. As you’d expect from a helmet of this price and quality, the dry-comfort material cheek pads in the Pista GP can be fully customised for optimum comfort and fit. Shark say that a shell made exclusively of carbon fibre is just too stiff, absorbs less impact energy and tends to be brittle, breaking on extreme impacts. The Race-R Pro’s answer is a layer of pure carbon fibre over a base layer of Aramid fibres, giving what Shark claims is the perfect level of stiffness. The Shark visors are also noticeably much thicker than any regular visor which helps to reduce distortion towards the edge of the field of vision. 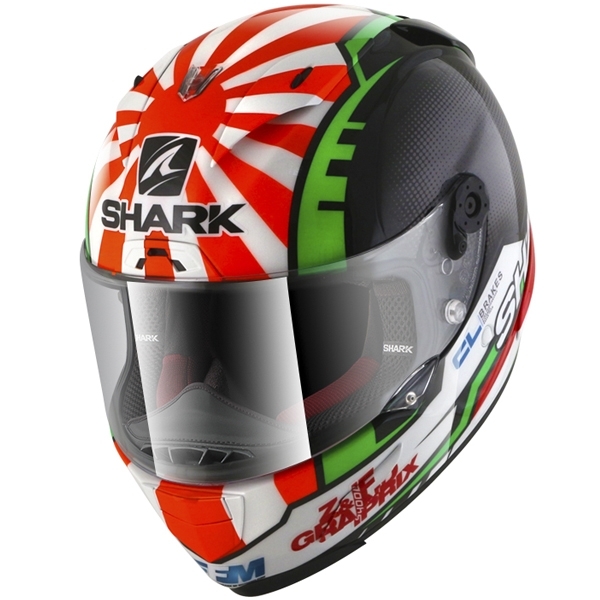 I also have a Race-R Pro on test and if you’re used to an Arai or Shoei then the Shark takes a bit of getting used to. The quick release visor system isn’t as sturdy as other systems and has left me fiddling with a detached visor on the side of the motorway on more than one occasion.